On the first point you can relax. For this commentator at least, the prospect of joining Kim Wilson on stage remains a pipe dream. 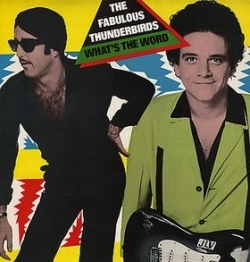 On the second however, we should begin with some reflections on last year’s Fabulous Thunderbirds performance in London. Summer 2013 saw Kim Wilson and The Fab T-birds playing London’s Jazz Café with their current line up – Randy Bermudes on bass, Mike Keller and Johnny Moeller on guitars and Jason Moeller on drums – and quite frankly the show was a huge disappointment. So much so, the venue had trouble drawing a crowd for the second night. In our opinion the band’s change of musical direction had a lot to do with it. No doubt many of those with tickets were anticipating a rerun of the 1980s, when Wilson, Ferguson, Christina and Vaughan used to visit the same neighbourhood to play Dingwalls, The Town & Country Club or The Camden Palace. 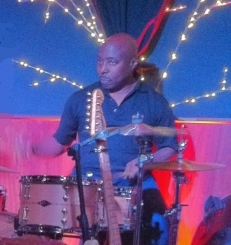 In contrast to the ’80s however, not only was the current set built on an agenda of unconvincing soul music, but the drummer was too tanked up to hold his sticks, let alone a four-four beat. Which may sound hilarious, but it was embarrassing to witness. Consequently the band had no bounce. To compound matters, when called to solo, the drummer’s sibling ground out a line of frustratingly barren guitar breaks that left us dreading further instalments. The whole thing was insulting and several folks left early. Although the other two band members were more business like, the acute imbalance in the team left Kim with too much to cover. Understandably, his harp playing became jaundiced and how on earth he persevered without decking Messrs M&M remains a mystery. To conclude the show, what should have been his crowning harp cadenza, became a ten minute ear bashing with Kim struggling to find anything of interest to visit on the crowd. Meanwhile, evidently unable to walk, the drummer remained behind his kit, goofing around and spilling beer, while the rest of the band vacated their stations to afford Kim Wilson his spotlight. Well I did say I’d tell it like it is, but that was then and this was now. 2014 found us with a fresh page and only one of the contemporary Fab Thunderbirds – bass player Randy Bermudes – in Kim’s line up. Randy is a musical professional and a loveable character, complete with his trademark porkpie hat, a full chin of whiskers and that curious ten-past-twelve guitar angle. When we chatted later in the evening, he sketched out the background to the previous summer’s show in London. By all accounts the band had been honouring a protracted trans-atlantic travel programme, which accounted in part for their performance levels. Kim, meanwhile, had driven up to San José from his base south of LA to play the two shows at Little Lou’s BBQ, both of which would have comfortably sold out several times over. 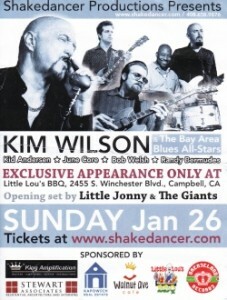 This was testament not only to Kim’s celebrity, but also to those involved in promoting, hosting and supporting the gig; namely Aki Kumar, Lance Wagner and Little Jonny & The Giants. As a music venue, Little Lou’s is somewhat unassuming from the exterior, nestling between an ice-cream parlour and a barber shop. Inside however, it’s the perfect setting for live music, with its own stage area, bar, meal counter and a big green monster’s worth of Red Sox memorabilia on the walls. 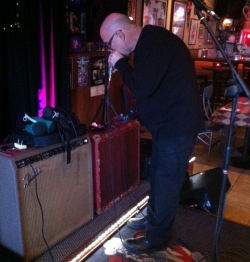 Kim carried two amps inside and set them up mid-stage. One was a 4 x 10 chocolate Fender Chorus, the other a beaten up, padded, red snake-skin amp with no visible identification. I quizzed him on the second amp. ‘It’s a 59 bassman – the one I used on all the Thunderbirds recordings‘. Of course (but it has been a few years). This left space behind and either side for the remainder of the evening’s line-up – Kid Andersen and Bob Welsh Jr. on guitars, June Core on Drums and Randy on bass. For those who are unfamiliar with Kim’s band for the night, let’s quickly run through the list. Kid Andersen is a first-call West Coast R&B guitarist, who started out in Charlie Musselwhite’s band, before transferring to Rick Estrin & The Nightcats when Little Charlie Baty retired from touring. Between shows, he records and produces at his Greaselands studio in San José. 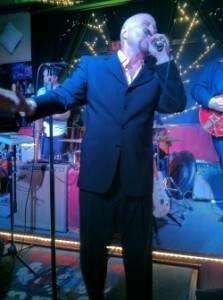 Bob Welsh Jr. plays guitar and keyboards with Elvin Bishop, Rusty Zinn and anyone else who can get their hands on him. June Core has been in Charlie Musselwhite’s band since 2004, but prior to that his pedigree stretches back to the Robert Lockwood Jr. and Johnny Shines band. So the stage was set. The headline band came with some seriously strong credentials. 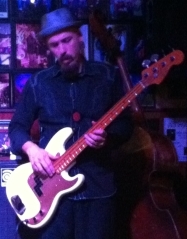 Kim had his red 59 Bassman. The crowd was waiting patiently in a line stretching the length of the car park. Little Jonny & The Giants were plugged in and tuned up. There were rumours that Rick Estrin and Dave Barrett might drop by. The Good Doctor was on his second pint of Wheat Beer. Lights, cameras….action! Would Little Lou’s be serving up a feast of red hot R&B, or just another soggy, London-style, soul food take out? Tune in for Part II – coming to a Harp Surgery near you very soon.